Summer top ten in Reykjavík! If you’re in Reykjavík for the summer months be prepared for an extraordinary energy boost that only comes with being in a city where night-time never falls! Here are just a few ideas of what you can do with all that extra energy! Stay up late and make your way down to the impressive Solfar Sun Ship sculpture by the waterfront in Reykjavik to watch one of the best nature shows on Earth – the setting of the midnight sun! Take in the sights, sounds and aromas of nature with a hike into the wilds of Heidmörk Nature Reserve in Reykjavík! Jump on a ferry and visit the beautiful island of Videy - a little treasure in the heart of Reykjavik where you can enjoy a combination of nature, history, art and culture! Make a splash in the remarkable thermally heated waters of Nauthólsvík beach – if you’re brave enough you can join the seasoned sea-swimmers for a cooler dip in the Atlantic too! Take in some epic panoramic views of the city by visiting attractive landmark building The Pearl; while you’re there you can also wander through the enchanting woodlands of Öskjuhlíd in the surrounding area. Experience pure thermal energy and take a dip in one of Reykjavík's many thermal pools and spas! A great way to recharge and a tonic for the body and mind! With all that extra energy you’ll have plenty of stamina to join the 24-hour party people and experience Reykjavík’s legendary nightlife! Visit the Reykjavík Old Harbour for a day of unique shopping and quality dining! Get there early and you could visit the whales and puffins too by joining one of the marine excursions on offer! For a great walk complimented by a good story take a guided walking tour of our city's landmark dwellings and their legendary inhabitants. This is a must on any history buff's itinerary! Rent a bike and discover the city by cycle! Our extensive network of well-maintained cycle paths leads through (and to) many beautiful places: you're sure to come across some of Reykjavík's hidden gems too! 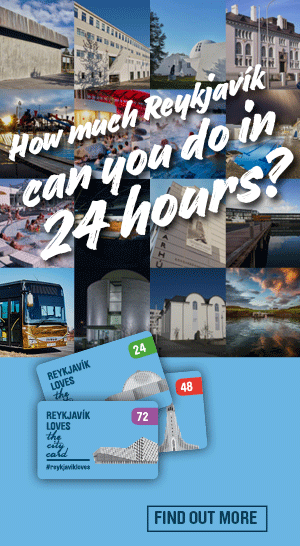 Whatever you do, don't do it without our fabulous money saving city card: The Reykjavík City Card!